During the homily, he reminded the parents of the importance of passing on the faith to their children and the great responsibility it entails. The Pope lamented that there are children who do not know how to make the Sign of the Cross. The Holy Father also apologized for making a delicate suggestion, namely to not fight in front of children, nor let them hear. While he admitted quarreling here and there is absolutely normal in marriage, do not underestimate the effect this has on the little ones. 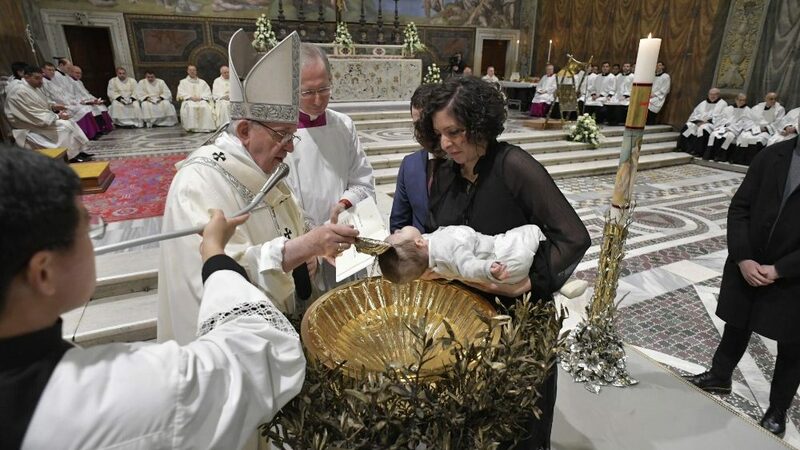 During his weekly Sunday Angelus, after the midday prayer, he told those gathered in St. Peter’s Square how, for this feast day, as is tradition, he baptized a group of newborns earlier. “We pray for them and for their families. And, on this occasion, I renew to everyone the invitation to always keep alive the memory of one’s baptism. “There are the roots of the our life in God; the roots of our eternal life, which Jesus Christ gave us with his own Incarnation, Passion, Death and Resurrection. The Holy Father noted that tomorrow, we return to Ordinary Time on the Liturgical Calendar. The Holy Father concluded, wishing everyone a Good Sunday and lunch, and reminding them to pray for him.